Bush had won re-election in 2004 by a razor-thin margin over Democrat John Kerry, and while Obama beat Republican Mitt Romney more decisively, he was one of the few presidents to win a second term by a margin lower than his first. Common to both men was a belief that their victories opened a door to opportunity in that first year after re-election. Bush declared, “I earned capital in the campaign, political capital, and now I intend to spend it.” Obama, who had dueled Romney through the campaign over his plan to extend tax cuts for the middle class but not the rich said the election had sent a “very clear message” from Americans. Both saw their job approval numbers suffer: Obama’s rating in December stood at 45%, down 10 points from the previous year. In that same month in 2005, Bush’s rating was 38%, also down 10 points from the previous year. And both saw significant declines in the ratings the public gave them in the first year of their second term on leadership, ability to get things done and trustworthiness. For Obama, negative views on all three traits increased by double digits over the course of 2013: Those seeing him as not trustworthy rose 15 points to 45%; those doubting him as a strong leader increased 11 points to 48%; and those who thought he was not able to get things done rose 14 points to 51%. Obama was faced most of the year with an economy that was inching into recovery, but one in which large percentages of Americans were still saying in a September poll that household incomes and jobs had yet to recover from the recession. Following the flawed rollout of the exchanges on which Americans were supposed to be able to shop for insurance under the health care law, 59% registered their disapproval of Obama’s handling of health care policy in an Oct. 30-Nov. 6 poll, and Americans were evenly divided over whether he had misled them in saying they could keep their current health care plans under the new law. On the foreign front, Syria cost Obama some of the support he had on foreign policy, with the public disapproving of his handling of the issue by 56% to 29%. If Obama was confronted with setbacks in 2013, so too was Bush in 2005, with the most prominent of them being the scathing criticism his administration received over its response to Hurricane Katrina. (In the immediate aftermath of Katrina, a Pew Research survey found that 67% of Americans thought Bush could have done more to speed up relief efforts). And the public was turning more negative on what had become a longer-than-expected war in Iraq — an issue that had come central in the 2006 midterm elections, according to a Pew Research survey. Both were among issues that contributed to sharp declines in public impressions of Bush’s trustworthiness, effectiveness and leadership between fall 2005 and March 2006, according to another Pew Research survey. 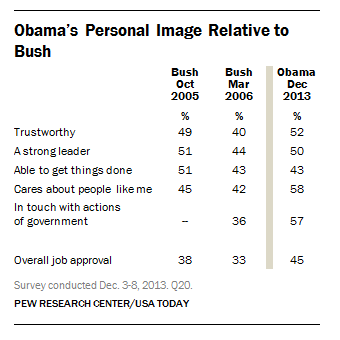 During that period, those seeing Bush as trustworthy dropped nine points to 40%; perceptions of him as a strong leader fell seven points to 44% and those believing in his ability to get things done went down eight points, to 43%.